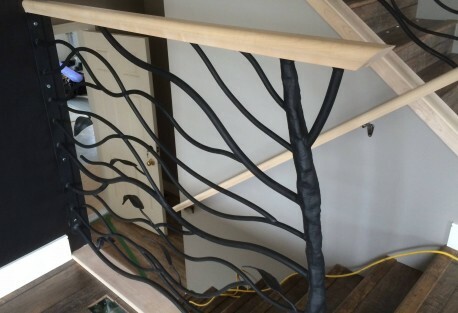 These custom tree branch stair railings were inspired by tree branches blowing in the wind. We used forging techniques on this wrought iron project to give a natural, organic look to the trunk and branches. This installation in a new residential home provides unique beauty as well as safety for their stairway. 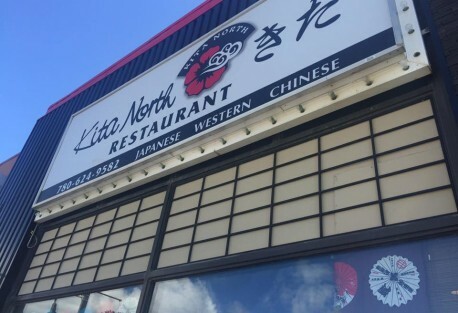 Kita North restaurant in Peace River had us build and install these custom metal grills, styled to match the front of this popular local sushi restaurant. Northern Sunrise County commissioned us to build a unique and artistic sign for their new Civic Centre, museum and restaurant. We built the sign out of a steel frame and by welding together antique farm parts, then painted and installed by welding to piles on site. 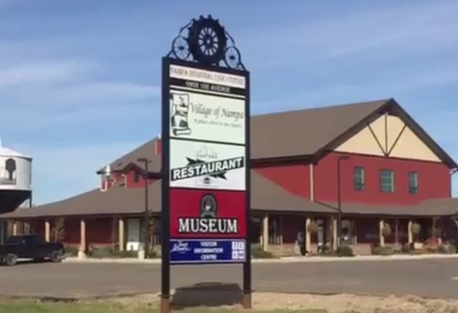 The sign now greets tourists with a bit of Nampa history. All of the farm parts used were salvaged from local farms and recycled for this project. This gate for a private home was inspired by a Greek wave. 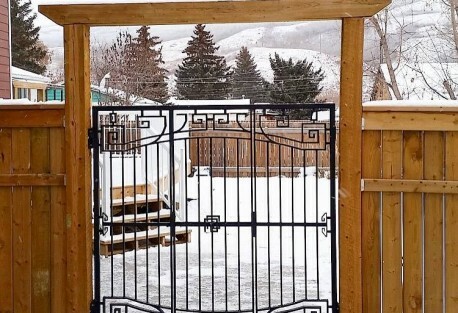 This gate is not only beautiful, but practical, with the ability to lock part of the gate in place, or open the entire gate. This allows for the passage of larger lawn equipment and quads.